Fig. 1Robert Elgood (Ph.D., Oxford University) needs no introduction in the field of Indian and Islamic arms and armor. Indeed, he is renowned internationally as being among the world’s leading experts on the subject and has published extensively. 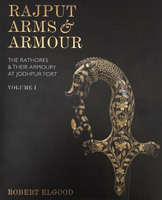 His latest two-volume masterful study presently under review, Rajput Arms & Armour: The Rathores & Their Armoury at Jodhpur Fort (New Delhi: Mehrangarh Museum Trust in association with Niyogi Books, 2017), was written in tandem with his 2015 catalogue, Arms & Armour at the Jaipur Court: The Royal Collection. Together, the two catalogues provide astute historical introductions, exceptionally well-illustrated object entries, and state-of-the-field analyses of two of the most significant intact royal collections of arms and armor. Fig. 2Following a Foreword by HH Maharaja Gaj Singhji Sahib II of Marwar-Jodhpur and the customary front matter, including detailed maps, the catalogue begins with an in-depth historical essay on the illustrious Jodhpur royal lineage, “The Rathores of Marwar,” and their palace citadel, Mehrangarh Fort (Fig. 1). Mehrangarh (“Fort of the Sun”) was founded in 1459 by Rao Jodha Rathore (r. 1438-1489) and completed in c. 1895 under Maharaja Jaswant Singh II (r. 1873-1895). The dynastic origins and martial milieu of the Rathores are narrated to proclaim their ancestral glory, and their distinguished role of honor in many of the major armed conflicts in South Asia during the seventeenth through early twentieth centuries is recounted to affirm their military prowess. Included is a perceptive discussion of the ethos of a Rajput warrior and the socio-cultural significance of their arms and armor, particularly the all-paramount sword. A representative portrait of the Rathore noble Kinjan Singh, now in the Los Angeles County Museum of Art (M.75.114.8), proclaims his warrior persona (Fig. 2). He wears a suit of chain mail armor and a helmet with an aventail or hood of chain mail. His helmet is embellished with two bejeweled turban ornaments (jigha). The turban ornaments and the halo surrounding his head indicate his royal status. Kinjan Singh carries two swords (note the varying hilts), a shield, and a rifle with an attached bayonet. His war mount wears an overcoat and chamfron of thick textile armor. Fig. 3The catalogue continues with three knowledgeable introductory essays on Rajput arms and armor. “Introduction to Rajput Arms” discusses the accumulative nature of a Rajput armory as a repository that developed over centuries. The critical hypothesis is presented that “Indian arms should be considered as component parts rather than a single object.” It is essential to differentiate the typically separate production and history of use for the blade and hilt of a given edged weapon. Accordingly, the blades and hilts of the catalogued weapons are analyzed separately and most often are found to vary in date and origin. Fine blades were frequently fitted with replacement hilts depending on the fashion du jour, with the complicated relationship between a weapon’s blade and hilt being further exacerbated by dealers in the marketplace continuing an age-old armory practice of swapping component parts in order to upgrade the appearance and/or salability of the weapon. A well-known mid-seventeenth-century painting from Mandi, long residing in the collection of the late Sir Gordon Howard Eliot Hodgkin CH CBE (1932-2017), may be mentioned also for providing visual documentation of the contemporaneous sale of individual sword hilts, which could then be fitted onto an owner’s existing blades (Fig. 3). The importance of the recognition of a bladed weapon having component parts, each with its own distinct history, cannot be understated because it calls into question the validity of the common worldwide museum and dealer practice of assigning a single date for the entire weapon. Not only does this affect the historical understanding of a particular weapon, but it may also have profound implications for its provenance. The essay concludes with discussions of types and uses of damascening, the introduction and development of jade hilts, nineteenth-century collecting and exhibiting of fine weaponry, traditional cleaning and measurement methods of blades, and common terminology. The second essay, “Arms Production & Trade in North-west India,” discusses trade routes and commodities during the Mughal period, especially arms and their necessary raw materials, as well as the role of royal ateliers (karkhanas) vs. independent artisans working for commission. The commercial city of Pali, in Marwar, is documented as an important center for the production of ivory carving, including various weapon hilts. The types, names, and Rajasthani places of mining and manufacturing of iron and steel are surveyed in the historical literature. Courtly and regional variations in hilt styles are listed with the author’s annotations. Varanasi and Lucknow animal-headed pommels are examined, with a special focus on enameled silver examples. The sweeping effect of the Arms Act of 1858 is addressed, including the resulting curtailment of arms production and the transfer of the damascened ornamentation techniques formerly used to enrich arms to decorate domestic objects and tourist knickknacks. The essay concludes with a detailed review of the representation and appeal of various regional productions of arms and armor in the grand industrial expositions of the nineteenth and early twentieth centuries. The third essay, “Craftsmen & Materials in the Jodhpur Armory,” describes the physical layout and administrative structure of the Jodhpur armory. Thomas Hendley’s detailed but incomplete accounts of the Jodhpur armory are evaluated, and compared against surviving court inventories. Various inventory records are quoted to provide a sense of the type of production or repair work done on the arms, the cost of the work, and the name, trade occupation, and origin of craftsmen involved in the work. Fig. 4Following the essays, the individual object entries are organized chronologically by Jodhpur regnal period and several thematic groupings, with each sovereign’s section introduced by a topical and historical discussion replete with portraits of pertinent personages and literary references to their noted arms. The swords and other arms illustrated are primarily drawn from Mehrangarh and greater Marwar collections. These are supplemented by select works from external holdings, principally the Victoria and Albert Museum, London, and the Wallace Collection, London. In fact, the inclusion and, especially, the discussion of major works from non-Mehrangarh collections as critical counterparts providing clarity to the present study of the Marwari works is among the principal contributions of the catalogue. For example, the first illustration (pl 5.2) of a sword in the chapter on “Early Swords in the Jodhpur Armoury” is the well-known sword of the Mughal Prince Dara Shikoh (1615-1659), identified by the stamped date of 1640/41 (1050 AH) and gilt inscriptions on the blade, now in the Victoria and Albert Museum (IS.214-1964) (Fig. 4). Because the blade’s stamped date of 1640/41 is traditionally used as the date of the current hilt of the Dara Shikoh sword, it is ostensibly appropriate to be included in the discussion of Mehrangarh’s “early” (sixteenth-seventeenth century) swords. However, a detailed analysis of the hilt style, particularly the elongated cone shape of the quillons, suggests the hilt is a replacement dating from the early nineteenth century. It was most likely executed around the same time as the gold with green enamel scabbard and sword belt mounts decorated with grape bunch-and-vine motifs. By reattributing key works in the art historical tradition, the scholarly importance of the catalogue’s discussions extends beyond the nominal parameters of the Jodhpur collection. Fig. 5The Jodhpur collection of weaponry is then catalogued as follows: Chapter 5, “Early Swords in the Jodhpur Armoury,” includes eleven khandas, a straight heavy quintessential Hindu sword, with the blades dating from the sixteenth or seventeenth century and generally steel talwar hilts of similar or somewhat later date. A few other swords of varying types are included, including examples with European or Deccani blades and hilts. Chapter 6, “The Swords of Maharaja Ajit Singh,” (r. 1707-1724) features eight khandas or khanda blades; six kirichs, a straight sword with a slight forward inclination to the tip of the blade; three talwars, a broad often curved sword; and 2 bughdas, a half-length heavy sword with a rounded tip used as a powerful cleaver. Chapter 7, “The Swords of Maharaja Abhay Singh (r. 1724-1749) and Maharaja Bakht Singh (r. 1750-1752),” presents four talwars; five kirichs or kirich blades; and one khanda. The hilts in this section are mainly nondescript steel or iron talwar or related forms. Two noteworthy exceptions are a late seventeenth-century Mughal talwar hilt with two-tone gold and silver Shah Jahan-style (r. 1628-1658) flowers “reminiscent of seventeenth-century bidri,” and an ostentatious late nineteenth- or early twentieth-century steel hilt with a knucklebow attributed to Udaipur. It is enriched with gilt silver ground with green enamel and foil-backed table-cut diamonds and cabochon rubies. Chapter 8, “A Group of Weapons from the Late Seventeenth to the First Half of the Eighteenth Century,” is a thematic group focusing on various types of weapons adorned with chiseled steel floral designs. The greatest number of works are katars, the idiosyncratic Indian punch dagger, along with several types of axes. Chapter 9, “Miscellaneous Swords in the Jodhpur Armory,” is a hodgepodge of swords and hilts ranging in date from the sixteenth through mid-twentieth century. A particular focus of this chapter is European (firangi) sword blades, distinctively long and straight, and Indian copies of European-style blades. The hilts from a variety of sources are generally somewhat later in date than the now-associated blades, but often of stunning quality and decoration. 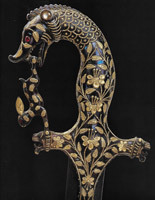 Included in this section is what is arguably the most demonstrative hilt in the catalogue, used as the cover illustration for Volume 1, a blued steel hilt in the form of a makara, a mythical aquatic animal, biting a hare-shaped knuckle guard with tiger head quillons and gold floral decoration (Fig. 5). The hilt is tentatively attributed to Udaipur, early twentieth century, whereas its shamshir, a curved sabre blade, is believed to be from Khurasan, c. 1880. Another exceptional hilt in this section is graced with a lion head pommel and quillons, and delicate vignettes of hunting scenes made of thewa (setting) work of gold foil fused to the surface of green glass. This distinctive technique is characteristic of Pratapgarh, with the attribution affirmed by a non-specific royal ascription on the knucklebow. Chapter 10, “Talpur Swords from Sind,” has eight swords, mainly shamshir, with exceptionally ornate hilts and gilt inscriptions on the blades, most of which are ascribed to Persia (Iran) or Indo-Persian work. These high-quality swords were made for the rulers and nobles of the Talpur dynasty, who ruled Sind from 1783 to 1843. Chapter 11, “Some Nineteenth and Twentieth Century Sword Hilts with Dated Inscriptions,” has a dozen swords, mainly talwars, each with an ownership inscription and date on the hilt or, rarely, blade. Inscriptions on swords are often notoriously spurious, so this group of valid examples it is important for enabling stylistic characteristics to be determined securely on the basis of the dated epigraphs. Chapter 12, “Children’s Swords,” presents ten examples of standard types, but rendered in the smaller proportions appropriate for a young prince. Volume 2 begins with Chapter 13, “Swords of the Maharajas 1843-1952.” From the period of Maharaja Takhat Singh (r. 1843-1873), there are two susan pattas, a sword with a forward curved blade; a kirich; five talwars; and a sailaba, a short sword with a forward curved blade. From the period of Maharaja Jaswant Singh II (r. 1873-1895), there are four talwars or talwar blades; and two khanda blades. From the period of Maharaja Sardar Singh (r. 1895-1911) and Maharaja Sumer Singh II (r. 1911-1918), there are a talwar and two shamshirs. From the period of Maharaja Umaid Singh (r. 1918-1947), there are three talwars and a presentation khukri, a Nepali knife with a heavy forward curved blade. From the period of Maharaja Hanwant Singh (r. 1947-1952), there are a khukri, a knuckleduster knife, a susan patta, and a sabre. Chapter 14, “Indo-European Swords in the Armoury,” presents a cavalry sword, an officer’s sword, five presentation sabres or sabre blades, a presentation talwar, and a presentation sword. Fig. 6The next two sections, Chapter 15, “Rajput Relations with the Mughals: Khil’at and Imperial Mughal Swords and Daggers,” and Chapter 16, “Swords with Mughal Umbrella Marks,” should be read as a unit. The former is essentially a detailed introduction to the subject, with only two swords from the Mehrangarh Armory included and nine important works from external collections discussed. The latter presents various talwars and shamshirs from Jodhpur collections that are embellished with the umbrella mark of royal ownership. Unfortunately, most of the marks are said by the author to be spurious. Such illegitimate umbrella marks are a common addition by unscrupulous dealers or owners wishing to increase the value of their weapons. In spite of these authenticity issues, or perhaps because of the author’s discernment and candor, the discussion of Imperial Mughal umbrella marks is one of the most consequential in the catalogue with ramifications far beyond its pages. The quintessential subject is the origin and historical use of the umbrella mark as a symbol demarcating the royal ownership of swords and daggers. A discussion of the historical background documents the early encounters between the Rajput and Mughals, and the importance of the umbrella as a symbol of royalty common to both groups, as well as other Indo-Islamic dynasties. Literary references to the royal umbrella from the reign of Emperor Akbar (r. 1556-1605) are studied first, and then a chronological review is presented of the extant umbrella-marked weapons of the Emperors Jahangir (r. 1605-1627), Shah Jahan, and Aurangzeb (r. 1658-1707). Variations in the iconographic form of the umbrella are analyzed, as well as inscriptions on the blades and literary passages describing the personalized relationship of the Mughal ruler with his principal arms, each often endowed with an honorific epithet. One of Aurangzeb's featured weapons is a double-edged khanjar dagger with its exquisite original horse-headed nephrite hilt, now in the Los Angeles County Museum of Art (M.76.2.7a-b) (Fig. 6). Gilt inscriptions on both sides of the blade forte document its ownership by Alamgir (Aurangzeb) and furnish the date 1660/61 (1071 AH). The author argues that the umbrella mark was added when the dagger was given away by the Emperor as a presentation item, which seems plausible to this reviewer given that the gold used for the umbrella visually appears to be a different composition than the gilding of the inscriptions and floral decoration on the forte and the adjacent acanthus leaves on the addorsed reserves. Alternatively, the umbrella’s gilding is perhaps merely in better condition and, thus, brighter. A technical examination is required to be certain. Regardless, the visual discrepancy suggests the imperial ownership inscriptions and the umbrella marks were not applied contemporaneously, which the author postulates. The originality of the hilt is corroborated by the atypical shape of the mouth of the hilt, which precisely follows the contours of the thin gilt border surrounding the floral decoration on the forte. This allows the hilt to be convincingly assigned the same date as the blade’s inscription. The stylistic and technical characteristics of the hilt also accord with the date near the beginning of Aurangzeb’s reign when the Shah Jahan style of jade working was still in favor at the Mughal court. Dating and attributing katars is a difficult task and there is no publication on this subject. Captured katars were taken to armouries far from where they were made, designs transferred, parts were recycled and many were refurbished or totally redecorated with new gold patterns which the original never had. From the nineteenth century many were made without regard to the historic origin of their design, solely to sell to collectors. Over centuries large numbers of katars were made in Delhi, Agra, Lahore, and Burhanpur, all Mughal capitals, but limited attributions are made regarding these towns today and nothing is attributed to Burhanpur though it is known to have made katars. Did these towns produce four distinguishable Mughal katar types at the same period? Some styles gradually elided as a consequence of political partnerships or dominance by one of the parties. The various katar designs attributed to places in given dates require supporting evidence to prove which are sixteenth- and seventeenth-century examples and which are latter copies or variations on the original. At present katars are regularly cataloged as seventeenth and eighteenth century with little or nothing to support the attribution. Overcoming these analytical constraints, fifty katars and a bladed implement are discussed, and detailed attributions for their blades, hilts, and any redecoration campaigns are presented. The attributions are supported by specific comparisons to relevant works, well as references to contemporaneous paintings with depictions of katars with parallel pertinent features. The discussion of a broad range of katars with diverse decorative styles and media makes this chapter a particularly useful reference tool for making comparisons with undocumented katars in other collections. Chapter 18, “Daggers,” continues the connoisseurship methodology utilized so effectively in the preceding chapter on katars. Curiously, however, it and the next four chapters lack an introductory essay, so the author’s cautions on facile attributions made for katars may be presumed to be equally valid for other types of daggers. The majority of the dagger blades and hilts are identified as Rajput, Deccani, or Iranian. The primary dagger types represented are khanjars; chilanums, a steel dagger with a recurved blade and thin baluster grip; kards, a small straight-bladed knife with hilts of various media; peshkabzs, a dagger with a single edge T-section blade; and chhuras or chhuris, a knife with a triangular single-edged blade, often with an abstract bird’s-head pommel. Chapter 19, “Ankus, Chhadi & Gada,” presents examples of five elephant goads, five staffs with curved heads, and six maces respectively, as well as a backscratcher and ascetic’s crutch. Chapter 20, “Tabarzin, Farsa, Gandasa & Zagnal,” discusses types of axes, particularly saddle axes (tabarzins) and knife-axes (gandasas). Fewer comparisons are offered in this chapter, with the entries predominantly being descriptive. Chapter 21, “Gupti, Spears, Pikes & Lances,” features swordsticks with concealed blades (gupti) and various types of spears. The latter are usually illustrated being held by palace guards, which provide a welcome glimpse of their contextual use. Chapter 22, “Khukri, Datali, Bows & Powder Flasks,” offers five additional examples of Nepali khukri knives; two illustrations of datali knives, with hooked blades used as scythes; four bows, including an eclectic “combination bow, shield and two percussion pistols”; and a selection of powder primer flasks made in a variety of forms and media, including the opalescent shell of a green sea snail. Chapter 23, “Armour & Shields,” opens with an introductory essay describing in detail the components of a complete suit of armor worn by the Emperor Aurangzeb in an equestrian portrait attributed to c. 1660-1670, now in the British Library (Johnson Album 3,4). Several pieces of actual body armor, and eight shields made in a variety of animal skins and decorative styles are discussed. Paintings of rulers with closely relating shields are illustrated, with one shield said to be the exact shield shown in a portrait of Maharaja Bijay Singh (r. 1793-1803). There are six historical appendices following the catalogue entries: Khanda Marriage, the translation of a text on the symbolic stand-in use of a ruler’s sword in a marriage ceremony; a translated treatise on swords dated 1706/07; selected Jodhpur armory records; a genealogical table of Rathore rulers; the Ballad of Sir Pertab Singh; and measurement standards. The publication is completed by two annotated glossaries, a general glossary and an arms glossary; an extensive bibliography; and an index. Readers might wish to familiarize themselves with the arms glossary before reading the entries, as the Indian names for the weapons are used to identify them in the entries and the sometimes subtle differences between certain blade types should be recognized. It would also have been helpful to add the European technical terms to the arms glossary for the various parts of blades and hilts, as they are frequently used in the text and neophyte readers may be unacquainted with them. For example, the Italian term “ricasso” is often employed, but it is not included in the glossaries or index. It refers to an unsharpened length of a sword or knife blade adjacent to the hilt. Fig. 7The author's writing style is terse, often encyclopedic in style, and the content is expansive. Consequently, a wealth of information is contained in the introductory essays, chapter introductions, catalogue entries, and glossaries. Two particularly significant topics will now be highlighted to demonstrate the erudition and merit of the text and to suggest additional considerations and references. The first topic is that of nephrite jade dagger and sword hilts made during the Mughal period. 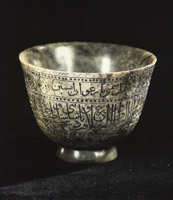 The author accurately summarizes our current understanding of the development of Mughal jades, specifically that the earliest jades that can be indisputably attributed to the reign of a Mughal Emperor are the handful of well-known works inscribed with the name of Jahangir and the date of the epigraph, with the earliest extant example being the mottled grey nephrite wine cup dated 1607/08 (1016 AH), long residing in the Guennol collection. (Fig. 7) It should be noted, however, that there are also uninscribed Mughal jades that may be plausibly attributed to the early seventeenth century. A noteworthy example is a pale green nephrite hilt for a small knife (kard), now in the National Museum, New Delhi (45.15/8) (Fig. 8). It can be stylistically attributed to the early seventeenth century on the basis of its now-missing decoration of gemstones set in a gold latticework of cusped quatrefoils, which parallels the design program often found on contemporaneous rock crystal kard hilts. The relative scarcity of early Mughal jades is noted, as well as the perhaps corresponding dearth of Mughal literary references to jade until the reign of Aurangzeb. Anachronistic jade hilts made in traditional styles for the early twentieth-century durbar celebrations are reviewed, as is the practice of reworking of earlier jades with later, more ornate styles of decoration. Katars with ornate jade handles made in the later nineteenth century are discussed. Although ostensibly functional, the brittle nature of jade renders the material impractical for effective use as sturdy handles necessary for military weapons and reveals their true raison d’être as items made for purely ceremonial purposes or the tourist market. Two examples of jade-hafted katars are illustrated. The author’s overall discussion of Mughal jades hilts is perceptive. A possible enhancement would have been an exposition on the stylistic characteristics of the jade-working typically found on nineteenth-century jades and more supporting photographic details. Fig. 8The second topic to be addressed concerns early enameling on silver in Lucknow. An extensive review is provided in the General Glossary of the state-of-the-field’s knowledge regarding the development of “Minai” (enamel) in South Asia, including technical and historical information about the leading regional centers of enameling; foreign enamelers active in India, especially French and Iranian; a plethora of relevant literary references, mainly Mughal histories and nineteenth-century exhibition catalogues and travel accounts; and pertinent enameled objects in worldwide collections. Separately, in “Arms Production & Trade in North-west India,” enameled silver objects from Lucknow are discussed, with the claim made that there are “modern examples incorrectly dated in major museums.” The disputed objects singled out are a gilt silver sword hilt with variegated enameling, now in a private collection, and a group of archer’s thumb rings, now in The al-Sabah Collection, Kuwait National Museum. The sword hilt was originally published by the late Mark Zebrowski as “North India, 17th century,” and subsequently by Manuel Keene as “Deccan or Mughal, late 16th-first quarter 17th century.” The archer’s rings have been attributed by Manuel Keene and Salam Kaouki to the “Deccan (probably Hyderabad? ), c. 1st third 17th century.” The hilt and rings are ascribed to what the latter authors term a “prototypal Lucknow” group of enameled objects. Robert Elgood reattributes the sword hilt and the thumb rings to the twentieth century on the historical assertion that “there is no evidence for Lucknow producing enamel at such an early date [early seventeenth century] and no surviving Lucknow pieces until the eighteenth century.” Regrettably, no specific stylistic characteristics or technical traits of the objects in question are presented in support of their dating revision. Rather, the author comments on their quality (the sword hilt is characterized as “fine” and the thumb rings as “poor”), and asserts that the rings are “now acknowledged to be modern” and made by a Lucknow enameler. Although the author’s reattribution to the twentieth century may well be accurate in this reviewer's opinion, more specific analyses of the objects themselves would have been helpful. Fig. 9In this context, it may be useful to identify what is generally regarded as one of the earliest extant enameled silver objects from Lucknow and one of the earliest and most important literary references to enameled silver objects associated with Lucknow, both dating from the first half of the eighteenth century. The object is a betel box (pandan) that has been attributed on stylistically grounds to the early eighteenth century (Fig. 9). Now in the Victoria and Albert Museum, London (IM.30-1912), it was a gift to the museum from Queen Mary (r. 1910-1936), who received it as a presentation item during the Delhi Coronation Durbar and Indian tour of 1911-1912. The pandan reputedly had belonged to the last King of Lucknow, Wajid Ali Shah (r. 1847-1856; exiled to Kolkata until his death in 1887). The literary reference documents the significant quantities of enameled silver metalware available to the Lucknow rulers by the mid-eighteenth century. 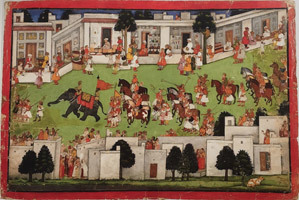 In late 1745, for the elaborate wedding celebration of his son Mirza Jalal al-Din Haidar, who would later rule as Nawab Shuja al-Daula (r. 1754-1775), the Nawab Safdar Jang (r. 1739-1754) sent a long procession of lavish gifts to the bride’s family that included “large numbers of vessels, such as cups, dishes and crockery of various shapes and workmanship. Conspicuous among these were more than a thousand silver vessels enamelled with gold, none of which cost less than one hundred rupees.” Given Safdar Jang’s position as the Prime Minister (Wazir) of the Mughal Empire, it is certainly conceivable that some or many of the enameled silver vessels had been made in Delhi rather than Lucknow, but the well-known exodus of artisans from Delhi to Faizabad and Lucknow and other regional courts following the sack of Delhi in 1739 by the Iranian King Nadir Shah (r. 1736-1747) suggests the likelihood that a proportion of the myriad enameled silver vessels may have been made in Lucknow or Faizabad. Rajput Arms & Armour: The Rathores & Their Armoury at Jodhpur Fort, by Robert Elgood, is an exceptional publication of fundamental importance to the study of South Asian arms and armor. It presents a sound methodological approach for cataloguing the weapons, including specific typological classification, object description, dating rationale, and relevant comparisons. The resultant object attributions can, in turn, be useful for evaluating related works. Collectors and curators may find some of its reattributions provocative, especially in regard to well-known objects in the public sphere, but a careful reading of the catalogue’s arguments should convince even the most skeptical that the reattributions are most often based on the physical evidence of the objects themselves and, thus, well-founded. The inescapable bottom line is that swords and daggers should be thought of as component works, with their current hilts typically not coeval with their blades. 3. Robert Elgood, Rajput Arms & Armour: The Rathores & Their Armoury at Jodhpur Fort, 2 vols. (New Delhi: Mehrangarh Museum Trust in association with Niyogi Books, 2017), p. 1:99. 4. Robert Skelton et al., The Indian Heritage: Court Life and Arts under Mughal Rule (London: Victoria and Albert Museum, 1982), pp. 63-64, no. 160, color pl. 4. More recently, Andrew Topsfield, Visions of Mughal India: The Collection of Howard Hodgkin (Oxford: Ashmolean Museum, 2012), pp. 122-123, no. 49. 5. Robert Skelton et al., The Indian Heritage: Court Life and Arts under Mughal Rule (London: Victoria and Albert Museum, 1982), p. 133, no. 428. 6. For a detailed discussion and numerous close-up photographs of the LACMA jade hilt, see Stephen Markel, “Mughal Jades: A Technical and Sculptural Perspective,” Asianart.com 2008, http://www.asianart.com/articles/markel2/index.html#2. 7. Robert Elgood, Rajput Arms & Armour: The Rathores & Their Armoury at Jodhpur Fort, 2 vols. (New Delhi: Mehrangarh Museum Trust in association with Niyogi Books, 2017), p. 2:616. 8. Robert Elgood, Rajput Arms & Armour: The Rathores & Their Armoury at Jodhpur Fort, 2 vols. (New Delhi: Mehrangarh Museum Trust in association with Niyogi Books, 2017), p. 2:656. 9. Robert Elgood, Rajput Arms & Armour: The Rathores & Their Armoury at Jodhpur Fort, 2 vols. (New Delhi: Mehrangarh Museum Trust in association with Niyogi Books, 2017), pp. 1:106-107 and in the General Glossary under “Yashm” (nephrite), pp. 2:975-976. 10. The best up-to-date scholarly assessment is Susan Stronge, “Jade at the Mughal Court in the 17th Century, Transactions of the Oriental Ceramic Society 76 (2011-2012): 71-84. 11. Ida Ely Rubin, ed., The Guennol Collection, vol. 2 (New York: The Metropolitan Museum of Art, 1982), pp. 62-67. 12. Stephen Markel, “Inception and Maturation in Mughal Jades,” in The World of Jade, ed. S. Markel (Bombay: Marg Publications, 1992), pp. 54, 56, nos. 7-8. 13. Another Mughal jade recently attributed to the early seventeenth century is a dark green jade bowl with bud-shaped handles, now in The Palace Museum, Beijing (102193). See Xu Xiaodong, ed., Heavenly Crafted: Selected Mughal Jades from The Palace Museum (Hong Kong: Art Museum, Institute of Chinese Studies, The Chinese University of Hong Kong, 2015), pp. 116-117, no. 3. 14. For a new analysis and additional considerations on this intriguing paradox, see respectively Susan Stronge, “Jade at the Mughal Court in the 17th Century, Transactions of the Oriental Ceramic Society 76 (2011-2012): 82; and Stephen Markel, “Inception and Maturation in Mughal Jades,” in The World of Jade, ed. S. Markel (Bombay: Marg Publications, 1992), pp. 51-52. 15. A bejeweled jade sword hilt thought to have been “made in Delhi under European direction,” c. 1900, may be one such example. 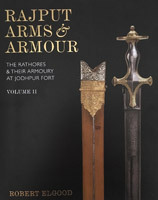 See Robert Elgood, Rajput Arms & Armour: The Rathores & Their Armoury at Jodhpur Fort, 2 vols. (New Delhi: Mehrangarh Museum Trust in association with Niyogi Books, 2017), pp. 2:546-547. 16. For examples of jade horse-headed dagger hilts reworked with later fittings, see Salam Kaoukji, Precious Indian Weapons: and other Princely Accoutrements. Dar al-Athat al-Islamiyyah. The al-Sabah Collection, Kuwait (London: Thames and Hudson Ltd., 2017), pp. 196-199, 202, nos. 67, 68, 70. 17. Robert Elgood, Rajput Arms & Armour: The Rathores & Their Armoury at Jodhpur Fort, 2 vols. (New Delhi: Mehrangarh Museum Trust in association with Niyogi Books, 2017), p. 2:659. 18. Robert Elgood, Rajput Arms & Armour: The Rathores & Their Armoury at Jodhpur Fort, 2 vols. (New Delhi: Mehrangarh Museum Trust in association with Niyogi Books, 2017), pp. 2:706-707. 19. Robert Elgood, Rajput Arms & Armour: The Rathores & Their Armoury at Jodhpur Fort, 2 vols. (New Delhi: Mehrangarh Museum Trust in association with Niyogi Books, 2017), pp. 2:959-961. 20. Robert Elgood, Rajput Arms & Armour: The Rathores & Their Armoury at Jodhpur Fort, 2 vols. (New Delhi: Mehrangarh Museum Trust in association with Niyogi Books, 2017), p. 1:133, see n. 135. 21. Mark Zebrowski, Gold, Silver & Bronze from Mughal India (London: Alexandria Press in association with Laurence King, 1997), pp. 80-81, nos. 66a-b. 22. Manuel Keene, “The Enamel Road, from Siena, Paris, London and Lisbon, leads to Lucknow,” Jewellery Studies 10 (2004): 110-111, fig. 18. 23. Manuel Keene with Salam Kaouki, Treasury of the World: Jewelled Arts of India in the Age of the Mughals (London: Thames & Hudson in association with The al-Sabah Collection, Dar al-Athar al-Islamiyyah, Kuwait National Museum, 2001), pp. 64-65, nos. 6.6-6.10); Manuel Keene, “The Enamel Road, from Siena, Paris, London and Lisbon, leads to Lucknow” Jewellery Studies 10 (2004): 99-126, figs. 8-13, 15-17; and Salam Kaoukji, Precious Indian Weapons: and other Princely Accoutrements. Dar al-Athat al-Islamiyyah. The al-Sabah Collection, Kuwait (London: Thames and Hudson Ltd., 2017), pp. 378-394, nos. 135-142. The individual attribution dates for the thumb rings in the 2017 catalogue slightly vary. 24. Robert Elgood, Rajput Arms & Armour: The Rathores & Their Armoury at Jodhpur Fort, 2 vols. (New Delhi: Mehrangarh Museum Trust in association with Niyogi Books, 2017), p. 1:149, n. 135. 25. Stylistic characteristics relating to the development of Lucknow’s enameled wares have recently been proposed in Madhu Trivedi, The Making of Awadh Culture (Delhi: Primus Books, 2010; reprint ed., 2013), pp. 244-246. Lucknow’s enameling tradition is suggested as having begun under the Nawab Shuja al-Daula (r. 1754-1775), principally on the basis of an enameled sword given in 1768 by the Nawab to Raja Balwant Singh of Benares (r. 1738-1770). See pp. 245, 276, n. 310; and George Watt, Indian Art at Delhi 1903: Being the Official Catalogue of the Delhi Exhibition 1902-1903. (Calcutta; Superintendent of Government Printing, 1903; reprint ed. Delhi: Motilal Banarsidass, 1987), p. 464. 26. Stephen Markel with Tushara Bindu Gude, et al., India’s Fabled City: The Art of Courtly Lucknow (Los Angeles: LACMA and DelMonico Books, 2010), p. 200, no. 87. 27. Robert Skelton, et al., The Indian Heritage: Court Life and Arts under Mughal Rule (London: Victoria and Albert Museum, 1982), pp. 112-113, no. 332. 28. Ashirbadi Lal Srivastava, The First Two Nawabs of Awadh. 2nd ed. (Agra: Shiva Lal Agarwala & Co., 1954), p. 110. See also Ashirbadi Lal Srivastava, Shuja-ud-Daulah, Vol. I, 1754–1765 (Calcutta: Midland Press, 1939), p. 6. 29. For additional discussions on Lucknow enameling, see Amin Jaffer, ed. Beyond Extravagance: A Royal Collection of Gems and Jewels. The Al Thani Collection. (New York: Assouline Publishing, 2013), pp. 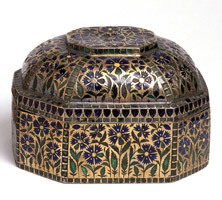 126, 134; and Stephen Markel, Mughal and Early Modern Metalware from South Asia at LACMA: An Online Scholarly Catalogue (Los Angeles: Los Angeles County Museum of Art, forthcoming). Stephen Markel, Ph.D., is the Senior Research Curator of South and Southeast Asian Art at the Los Angeles County Museum of Art.